With advances in technology being made every day, having the ability to work and play anywhere has never been easier. Along with smart phones and tablets, wireless keyboards give us the freedom to leave our desks behind. With the use of these devices at an all-time high, many people are using their phones and tablets for writing school papers, e-mail, and in many areas of business. Sometimes, a portable keyboard is ideal for on the go, and they certainly help speed up the task. 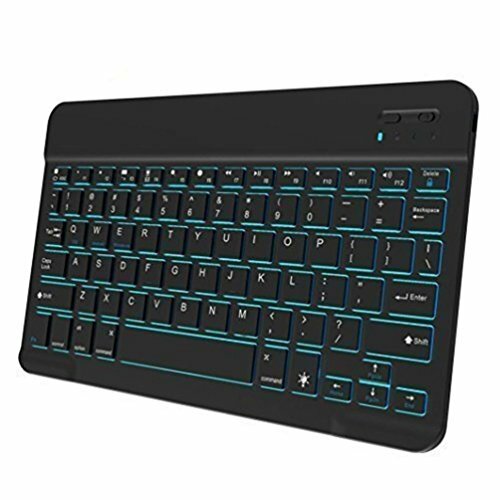 With so many brands of smart phones and tablets available, it can be hard to find the perfect keyboard that works best for your Android phone or tablet. We have written an Android keyboard buyers guide in hope of helping you find the ideal keyboard. There is a list of features to consider before purchasing. And, we have also reviewed, in our opinion, the top 10 best Android keyboards. Keyboards have come a long way from the silicone keyboards that came standard with our first computers. From full-size to portable, backlighting and hot keys are just a couple of the features now available. We also want to make sure we are getting the best deal for our money. It’s always a great idea to consider keystroke life, battery life, and warranties. Here are a list of features to consider before purchasing your Android keyboard. Size – Smart phone and tablet keyboards are often used on the go. It’s important to decide whether or not your keyboard needs to easily fit inside your briefcase or even your pocket. There are Android keyboards that are full-size, compact, and foldable. Keystroke Life – Many keyboards have anywhere from a 3 million to 5 million keystroke lifespan. Bluetooth Distance – Many of our reviewed keyboards are usable up to 33 feet away. Be certain to check the average Bluetooth distance before purchase. Hot Keys/Function Keys – Many keyboards come with operating system specific hot keys and multimedia keys. Battery – Be certain to check whether or not batteries are included, how long they last in between charges, and how long it takes the device to charge. Ease of Switching Between Devices – Many people use a smart phone and then a different brand tablet. If you’re wanting a keyboard that will work with all of your Bluetooth devices, be sure to check the operating system compatibility. Layout – Android keyboards come in full-size with the full QWERTY layout, and there are others with a more compact layout. BATTOP offers a universal keyboard for iOS, Android, and Windows. The strong, yet portable, design features an alloy support frame and a non-slip mat in the phone bracket to keep your device stable. The keys are quiet and have a keystroke lifespan of 5 million. It features hot keys, media keys, and has a Bluetooth distance of more than 33 feet. It can be used for 40 hours between charging and has an auto power saving mode after 12 minutes of inactivity. This keyboard comes with 1 USB charging cable, a carrying bag, and a 1 year warranty. The ergonomic design of this ultra-slim keyboard creates a more comfortable typing experience. It is easily transported and includes a built-in rechargeable li-polymer battery. It can be used up to 60 hours per charge. Made of aircraft aluminum, this keyboard is sturdy, yet light. It is compatible with iOS, Android, and Windows and features hot keys for each operating system. The scissor switch keys are quiet, easy to read, and have a 3 million keystroke lifespan. Power saving mode is activated after 10 minutes of non-use. It includes a USB cable and a manual. Jellycomb offers an inexpensive, slim, and portable keyboard for all 4 operating systems. Windows, Android, iOS, and Mac users will find hot keys specific to each system. The Bluetooth 3.0 technology offers a distance up to 33 feet. It requires 2 AAA batteries and will last up to 700 hours inbetween charges. The scissor switch keys are easy to read and quiet. After 10 minutes of inactivity, the keyboard shuts down to save battery life. 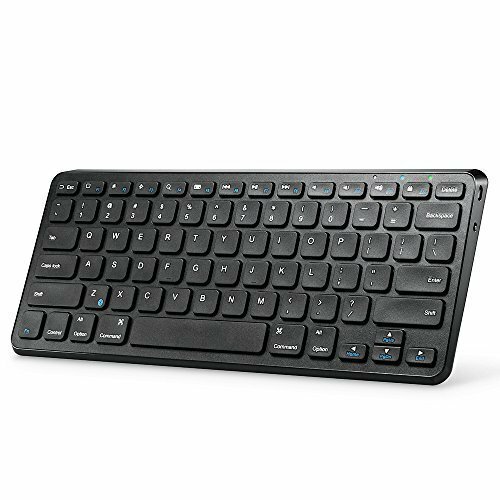 AmazonBasics features a keyboard designed just for Android phones and tablets. It has a slim and compact design and pairs easily with your device. It has an ergonomic tilt design with scissor switch keys creating a pleasant typing experience. It features a 30 foot range, a sync confirmation light, and a low battery indicator. 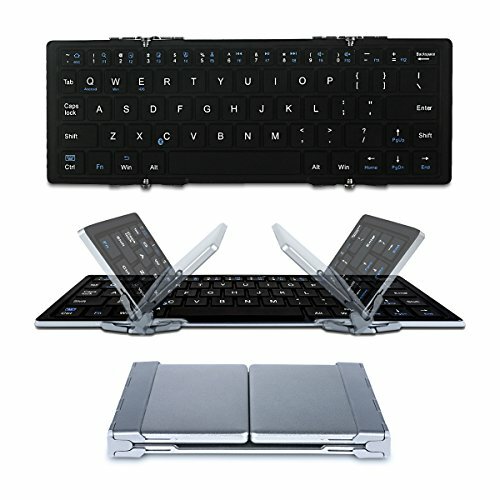 The AmazonBasics keyboard is compatible with the KindleFire HD and HDX and other Android 3.0+ devices. It also includes a 1 year limitied warranty. OMOTON also offers an Android-specific keyboard that is portable and inexspensive. It features a Bluetooth connection up to 33 feet and a battery life of up to 30 days of continuous use. It features a QWERTY layout with 78 keys including 13 Android specific hot keys. The keyboard powers off after 10 minutes of inactivity. It is compatible with the following devices: Samsung Galaxy, Galaxy Note, Galaxy Note Pro and Tab Pro, Google Nexus 9 and 7, Apple iPads, and Apple iPhones. 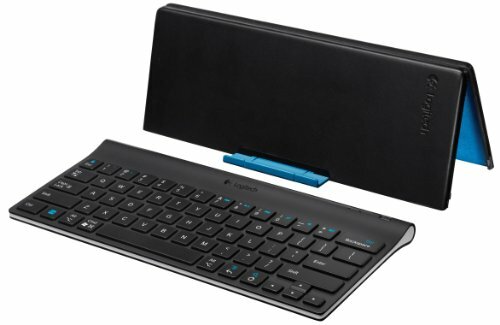 Logitech offers an Android-specific keyboard that features a carrying case that also works as a stand. The adjustable stand allows users to view their phones or tablets in landscape or portrait. It has a Bluetooth distance of up to 30 feet and features media control keys. 4AAA batteries are included, and Logitech offers a 3 year limited hardware warranty. 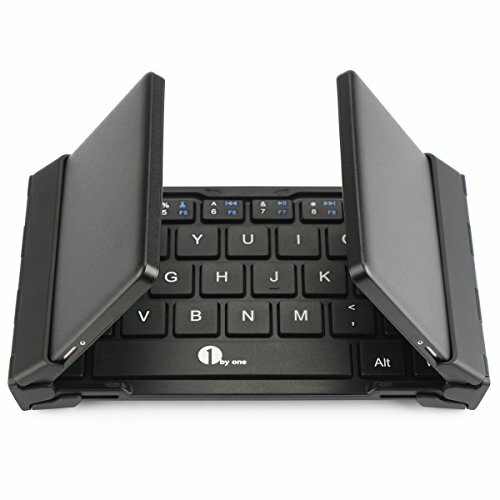 1byone offers a unique foldable Bluetooth keyboard that is compatible with all four operating systems and most Bluetooth-enabled devices. Made of aluminum, it has a built-in 210mAh rechargeable lithium battery. The battery allows 64 hours of continuous use or 114 days in standby mode. It takes approximately 4 hours to charge and features smart auto on/off. 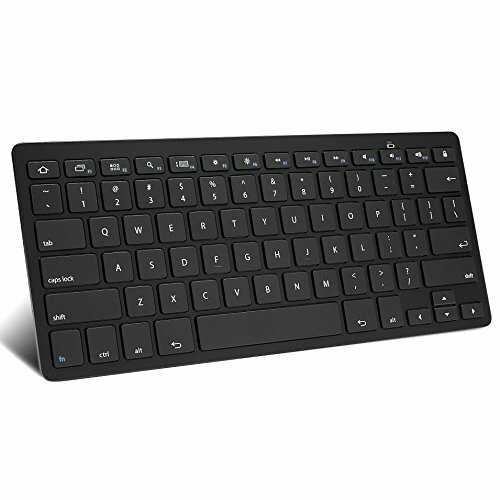 This 1byone keyboard has a QWERTY layout with hot keys and has a Bluetooth distance of up to 33 feet. It also comes with a 12-month guarantee. Anker’s slim profile keyboard is versatile with all 4 operating systems. It features low-profile scissor switch keys with a matte finish. The keystroke lifespan is 3 million. The rechargeable lithium battery lasts 6 months between charging based on 2 hours use per day with a charging time of 2 1/2 hours. It includes a 2.3 micro USB charging cable and an 18 month warranty. This Anker keyboard automatically powers off after 30 minutes of inactivity. 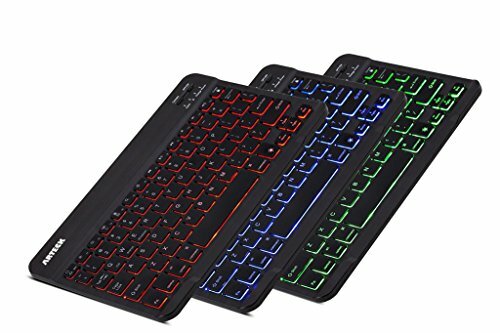 Many keyboard users are enjoying backlighting, a fun and helpful feature that is popping up in several different brands of keyboards. 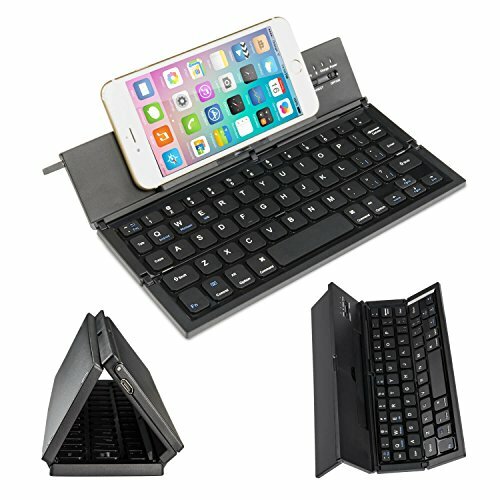 Arteck offers a Bluetooth keyboard for all 4 operating systems-iOS, Windows, Android, and Mac. You can choose to display 1 of 7 colors with 2 brightness levels. It has a built-in rechargeable battery with a 6-month life based on 2 hours use per day with the backlighting off. The scissor switch keys are low profile and quiet with a 3 million keystroke lifespan. It features function keys, media keys, and Windows hot keys. It comes with a USB charging cable and a 24 month warranty. 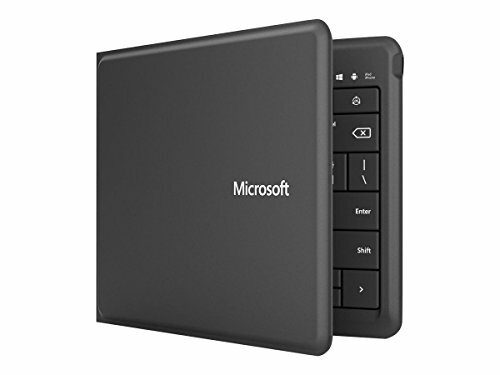 Microsoft offers a universal keyboard that works across most Bluetooth-enabled devices. It’s lightweight and foldable making it easy to carry with you at all times. It features a full-size keyset with spill-resistant and water repellant keys and fabric. It features the latest Bluetooth 4.0 technology and has a built-in rechargeable battery that lasts up to 3 months between charges. It also comes with a 3-year warranty. We hope you have found this guide helpful in your search for the best android keyboards for your Android device. Our best advice is to determine the features that are important to you, narrow your selections down, and then read reviews before choosing. Company satisfaction guarantee is an excellent perk when choosing any new hardware.